I noticed one day that in a picture of me my skin looked shiny. I have never had oily skin and was thinking that it was odd. I started noticing that my skin did become oily throughout the day. 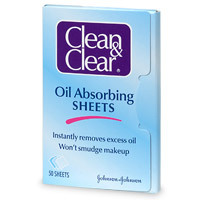 I heard about the Clean & Clear Oil-Absorbing Sheets but never bought them because I thought it was kind of expensive. I decided to finally buy them and was very pleased that I did. There is 50 in a pack for about $5.99 in Canada, cheaper in the USA. They are blue sheets that you take out and blot all over your face and they absorb all the oil. The sheets worked very well. One sheet took all the oil off my face and left all my makeup on. I have also tried the Sonia Kashuck Oil Blotting Papers. I did not like the Sonia Kashuck ones, you can read my review on the Sonia Kashuck Matte Oil Blotting Papers here. I highly recommend the Clean & Clear Oil-Aborbing Sheets. I will be purchasing many more packages to come. Have you tried any other Oil-absorbing sheets? If so let me know in the comments what your favorite brands are. I love trying out new products, and hate wasting my money on bad ones.